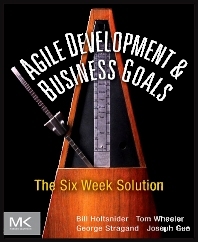 Agile Development and Business Goals: The Six-Week Solution is a guide for the software development process, which can be challenging, difficult, and time-consuming. This process, called the “Agile” process, is unique, and it features several aspects that distinguish it from the classical methods of software development. The book offers readers information about the design, implementation, and management of the different methods of creating world-class software. The book discusses the various reasons that the development of software is a difficult process, and it addresses how software development sometimes fails and why it seldom aligns with business needs. It further examines the risk associated with software creation and the different ways to mitigate them. This book is relevant to software development managers responsible for creating quality software products, and managing software development teams. George Stragand is a manager and software developer with over 20 years of producing and managing the delivery of commercial software on time. He has worked for companies ranging in size from startups to multinationals, creating software both for external and in-house use. He still hasn’t found a problem which couldn’t be solved by one more level of indirection or a suitable amount of explosives in the correct location. Director of Software Development at ClickFox; for over 20 years he has been producing and managing the delivery of commercial software on time. Joseph Gee has spent the last 10 years of his career leading and coaching teams through a variety of successful projects and Agile transitions. His advocacy for software craftsmanship has equipped teams for success in small custom shops, large telecom enterprise systems, commercial shrink-wrap modeling software, and, most recently, cutting edge behavioral analytics. Senior Software Architect at ClickFox with more than 10 years of experience leading and coaching Agile development teams. "The ability to think of software development as a part of the business is lacking in far too many organizations. Many CIO’s report to the COO or even the CFO - as opposed to the CEO. Technology is only going to become more and more important in the coming years, and the organizations that are able to align this to their financial needs and delivery needs are the ones that will succeed in the new economy. The ability to show and understand the alignment of a business sector bottom line to these methodologies will give companies some support in leaping the chasm to true Agile development. "All agile practitioners dream of achieving development flywheels that yield high-value features on a predictable cadence. While today’s hubbub about Agile promises this, achieving it and then sustaining on-going momentum are difficult to say the least.